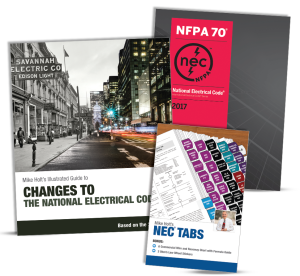 This is a Saturday 8-hour CEU that will help you understand the newest changes to the 2017 NEC Code. Article 425, titled Fixed Resistance and Electrode Industrial Process Heating Equipment, provides installation rules for industrial heating equipment not addressed elsewhere in the code. Article 690 provides installation rules for Large-Scale Photovoltaic (PV) Electrical Power Supply Stations. These systems are privately owned and no smaller than 5000 kW in size. Article 706, Energy Storage Systems (ESS), accommodates those systems that are intended for short term augmentation of the utility supply during peak consumption times. Article 710, Stand-Alone Systems, is a small article that addresses any small alternative energy supply systems such as wind machines, photovoltaic systems, or others where other NEC® articles are not sufficient to provide the necessary installation rules. Article 712, provides for small direct current systems that are being used where security from outside threats are a concern. This new article ensures the systems will provide reliable and safe service in a critical function. NOTE: All purchased book(s) will be distributed on the first day of class! Register below or view all upcoming CEUs. NOTE: All purchased book(s) will be distributed on the first day of class. 2017 NEC Code and other optional items are now available! Get yours at iecrm.org/books. Please Note: This CEU class meets the new Colorado state requirements for the 2017-2020 code cycle. See below for more information from DORA’s website. Governor Hickenlooper signed House Bill 16-1073 into law on April 15, 2016. This law replaces the current continued competency program with a requirement of 24 hours of continuing education to be completed each renewal period. The Continuing Competency (CC) Assessment will no longer be administered. Before renewing your license in September 2020, all licensed electricians will have to complete 24 hours of continuing education, called Continuing Education Units (CEU). If you choose this payment option, your booking will NOT BE CONFIRMED until we receive your check payment. To guarantee your reservation, please choose to pay with credit card instead! This is a secure payment. We do NOT store your credit card information.